How do marine invertebrates communicate using sound? 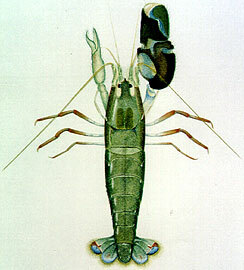 The snapping shrimp, Alpheus heterochaelis. Courtesy of Department of Applied Physics, University of Twente. Acoustic communication in marine invertebrates has not been studied to the same extent as it has been for other marine animals. However, several marine invertebrates have been found to produce sounds for defensive and courtship purposes. The snapping shrimp produces sound in a most interesting and unique way. Upon closure of its enlarged claw, or cheliped, a bubble is formed that cavitates, producing a loud popping sound (see How do marine invertebrates produce sound?). The force of the cavitating bubble is so powerful that it can stun or kill prey items. In the same way, the bubble is used to ward off predators. Members of the spiny lobster family Palinuridae also produce sound as a defense mechanism. The lobsters generate stridulatory sounds via their plectrum and file when the antennae are moved (see How do marine invertebrates produce sound?). Research conducted with European spiny lobsters in aquariums showed defensive posturing and clicking sounds produced by the spiny lobster in response to predatory behavior by the gray triggerfish. Caribbean spiny lobsters that produced rasp sounds were better able to escape predatory octopus attacks and resist attacks for a longer duration than silenced lobsters. Semi-terrestrial crabs, such as fiddler crabs and ghost crabs, produce sounds that are transmitted through the air and the substrate (see How do marine invertebrates produce sound?). These crabs sense substrate vibration through mechanoreceptors and some species can sense air-borne sound through pressure-sensitive membranes. (see How do marine invertebrates detect sound?). A fiddler crab uses its cheliped to produce sound to attract females as well as deter predators and other male competitors. Photo courtesy of Jerry Prezioso. Male fiddler and ghost crabs produce rapping or honking sounds as one way to court females for reproduction. 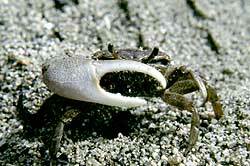 During the day, male fiddler crabs will wave with their enlarged claw to attract females to their burrow. Once a female crab approaches, the male switches to sound production from within or just outside of his burrow. To produce sound, the male crabs will strike the substrate with the lower base of their enlarged claw, drum on the substrate with both claws, and/or tap the ground with their walking legs. Calling bouts last several minutes. Some species of fiddler crab also chorus at night. Males will spontaneously rap just outside their burrows for several hours. Scientists have found that male crabs actually “pay attention” to neighboring males that are drumming or rapping. If one male begins to produce sound vigorously, other males may respond by also increasing the speed and loudness of their sound production. Additionally, if one male is silent and a neighboring male begins to produce sound vigorously, the previously silent male will often join in. Male crabs will also alter their calling rate to avoid overlap with other males. A male crab that avoids overlap between his calls and that of a neighboring male will present a distinct signal that can be better detected by a receptive female. Although semi-terrestrial crabs produce sound primarily for courtship, it may also serve as a warning signal to communicate information to other crabs about the presence of a nearby predator. The crabs also produce sounds during agonistic interactions with other male crabs. Some marine invertebrates communicate with sound for purposes other than defense and courtship. Cleaner shrimp feed on the parasites found on the skin of reef fish. The shrimp will clap one pair of claws when reef fish approach, advertising their cleaning services. The hungrier the shrimp is, the more clapping it does. Clapping also acts as protection against predation. By clapping, the cleaner shrimp announces itself as a cleaner; shrimp were shown to clap more often when predatory fish approached. Cleaner shrimps identify themselves as a “cleaner” and advertise their services to reef fish by clapping their claws (chelipeds). The hungrier the shrimp, the more clapping it does. In this video, one can watch a cleaner shrimp (small, transparent animal at center) clap/signal to reef fish swimming nearby. Video by Lucille Chapuis, University of Western Australia. Sebeok, T., ed, 1977, “How Animals Communicate.” Indian University Press, Bloomington, 305-307. Salmon, M. (1983). Acoustic “calling” by fiddler and ghost crabs. In Papers from the Conference on the Biology and Evolution of Crustacea. Australian Museum Memoir 18 (pp. 63–76). Sydney, New South Wales, Australia: Australian Museum. Taylor, J. R. A., & Patek, S. N. (2010). Crustacean seismic communication: Heard by not present? In C. E. O’Connell-Rodwell (Ed. ), The Use of Vibrations in Communication: Properties, Mechanisms and Function across Taxa (pp. 9–23).